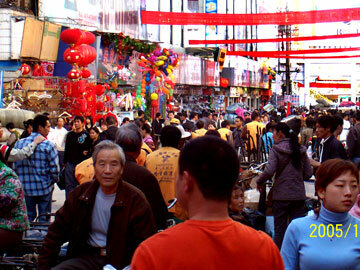 We moved to Kunming in 2005 after three years in Xi'an (and before moving to Xiamen). There were many things we loved about Xi'an, but we missed seeing blue skies, and we got very tired of coughing every morning because of the pollution. After spending two weeks in the hospital with pneumonia (January 2005) we decided it was time to look for "bluer skies" and we found them in Kunming (Yunnan Province). Buttons in the gray box above will take you to several sub-pages, including the International Horticultural Expo and the Minorities park, Kunming's connection to the Flying Tigers and the Burma Road, a "digital treasure hunt" at Green Lake Park, photos of Kunming Medical University (as well as other past universities I've taught or studied in), and photos/essays from my students about the practice of medicine in China. Also, click here for photos of our apartment, and don't forget to look at the other two Kunming pages (2) (3). The main plaza downtown is a wide car-less street with shops of every description. This beautiful gate is flanked by KFC and Parkson's on one side, and Pizza Hut on the other. 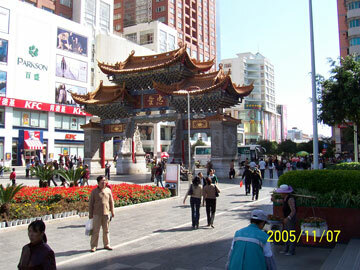 Two of the three McDonalds in Kunming are also on this plaza. Not far from the gate, you can find a fountain (next photo). When we lived here, Vivian used her extensive administrative experience to serve as the (volunteer) administrator of the Jian Hua Services representative office in Kunming. Jian Hua has dozens of associates in Yunnan who serve as teachers, doctors, community health workers, agricultural and small business experts, child-care (orphan) providers, and much more. 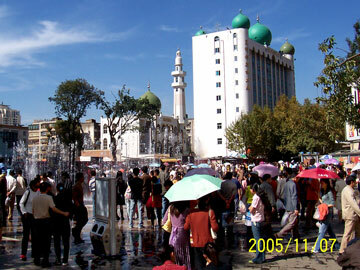 The plaza's fountain/sprinkler is very popular when Kunming's hot sun is out in force. In the background you see the city's biggest mosque, and St John's is just to the left (not shown). This attractive view is now gone, since a new department store/movie complex stands between the mosque and the fountain (see below). 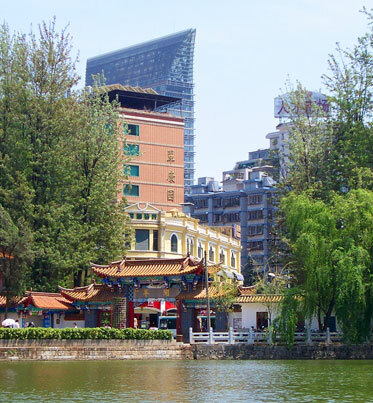 (above, below and right) A key focus of activity in Kunming is the beautiful Green Lake Park (near the major universities). Russian sea gulls have been spending the winter here for decades.  (For a better photo, see our Free Wallpaper page.) The area is a great place to entertain visiting friends, like Michael's long-time friend Jimmy (right) from their days at Xiamen University. (below) Kunming has several Wal-Marts and Carrefours, as well as other large Chinese or international markets, but the biggest market is Lou-si-wan--a vast wholesale shopping area with everything from Christmas trees to clothes, and from shoes to plumbing supplies. If a Chinese-made product is not at Lou-si-wan, it's probably not available in Kunming. 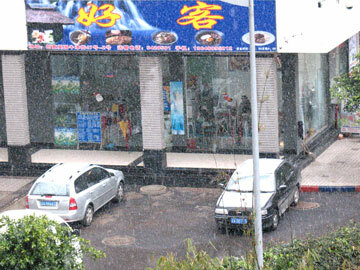 Below is the old Lou-si-wan in Kunming, torn down in 2009 when the complex was enlarged and moved to Chenggong (about 45 minutes from Kunming). 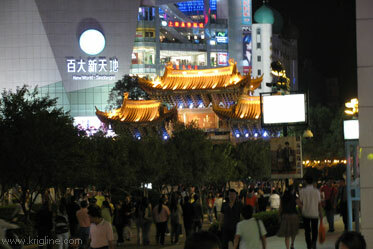 Michael's first teaching job in Kunming was at YNUBS, just down the road from this temple. 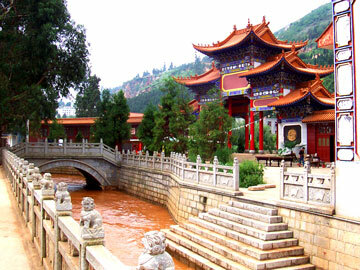 Kunming is dry most of the year, but this was taken in the fall rainy season (which accounts for the muddy river). 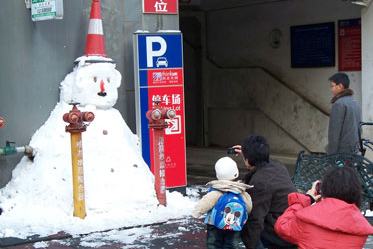 We were shocked on Feb 1, 2007 (and March 2008, shown below the 2007 photo), to wake up and see snow covering the cars in the parking lot below us. 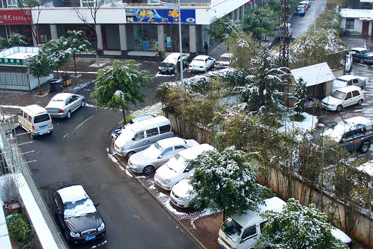 Remember that Kunming buildings don't have heat; in fact, businesses always keep their doors open (even when it is snowing) to show that shoppers are welcome! Vivian took this photo in Green Lake Park. 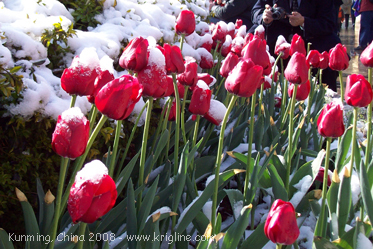 I love the contrast of tulips and snow!